I’ve long been a fan of Livescribe’s smartpens. I purchased the very first one and used it constantly. Updates to the hardware and software since then have been notable evolutionary steps forward. With the Livescribe 3 Smartpen, the device takes a huge leap forward, and in the process becomes an extension of your phone or tablet. It is awesome. With the Livescribe 3 Smartpen the company set out to do two main things… and they achieved both. First, they wanted to move the pen a bit forward in the ergonomics and aesthetics department. Previous Livescribe Smartpens were fine, but they very much looked like tech pens. Part of that was simply a result of technical necessities. 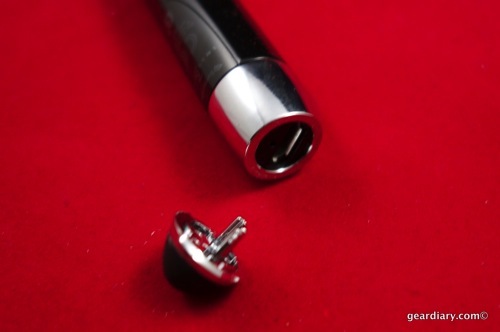 For example, the tip of the pen had to house the camera that tracks the pen’s movements when used with special Livescribe paper. There was no way around that. In addition, since the device was designed to stand as its own independent unit, there needed to be a way to control it, see what it was doing and recharge it. This resulted in the need for buttons, a screen and a port for recharging. Since the pen needed to be able to communicate with the user AND record audio, it needed a microphone and speaker built in. And since there were times when the audio would be problematic were it playing out loud, the company had to add a headphone jack. That’s a lot of tech and functionality that needed to be built into something that looks like a pen. The result was a rather large pen. No one looking at the first Livescribe Smartpens would mistake them for anything but what they were- a high-tech pens. Second, as mentioned previously, the first Livescribe Smartpen’s were all standalone devices that would be used on their own and then synced with a computer. This was done via a physical connection initially and then moved over to a wireless connection with the introduction of the Livescribe Sky. The Sky was definitely a step forward but it was simply a wireless variation on the same theme — you would take notes and record audio with the pen and then send all of the data over to your computer. From there the information could be saved, shared or sent to Evernote. From there it could be accessed on a smartphone or tablet using the Livescribe app. 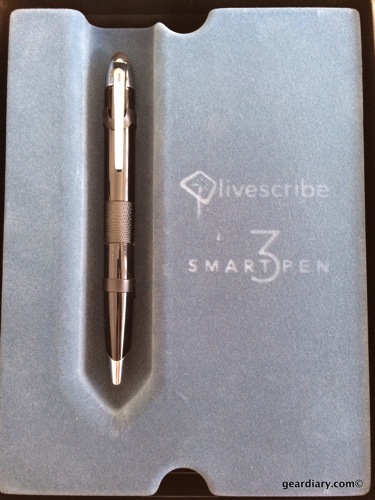 With the Livescribe 3 Smartpen things have taken a huge leap forward. The pen is far more stylish thanks to the company turning to a pen designer. And because it is now an extension of your tablet or smartphone the need for controls, a screen, a headphone jack and a microphone is gone. 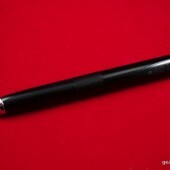 The result is a pen that is slimmer, more stylish, and looks less like a tech pen than ever before. Here’s a bit of our conversation with Livescribe during CES 2014. Looks great doesn’t it? And that’s just the beginning. It may look more refined but this is still the best tech pen on the market. Putting The Smart in Smartpen: The streamlined design of the Livescribe 3 smartpen conceals an astonishing amount of technology. An infrared camera, ARM processor, Bluetooth Smart chipset, flash memory and lithium-ion battery all work together to bring your notes to life on your tablet or smartphone. Not Just Bluetooth, Bluetooth Smart: Bluetooth Smart wireless technology allows your Livescribe 3 smartpen to quickly and easily pair to your tablet or smartphone. It also extends the battery life, giving you over 14 hours of continuous writing between charges. 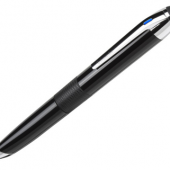 The Livescribe 3 Smartpen is different from its predecessors in the way it interacts with mobile device. Previously, the app was an extension of the Livescribe desktop program. It is a serious oversimplification but is best understood as the mobile app allowing you to access what you have already created. In the years since the first Livescribe Smartpen was introduced, the world has gone mobile; it is rare for anyone to NOT have a smartphone and/or tablet with them. 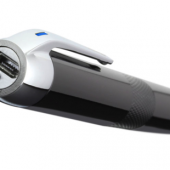 That means the Smartpen doesn’t need to stand on its own in quite the same way any longer; instead it can be an extension of the mobile device and serve as the handwriting input system for it. That’s what the Livescribe 3 Smartpen is all about. 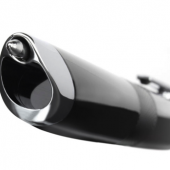 With the Livescribe 3 Smartpen the app becomes a central part of the Livescribe experience. When the pen is connected the text is sent to the device in real-time. (The first time you see it happen is pretty amazing.) And the mobile device, currently limited to iOS becomes the audio recorder. You are still able to keep the text and audio in sync but only when the app is running while you take notes. There is no microphone or speaker on the pen itself. And the app itself… As we will see in a moment, that is far more powerful than before. 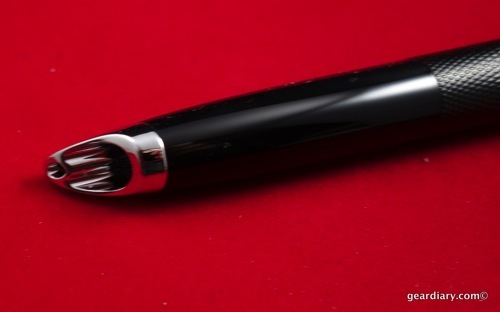 The pen still needs to have a camera in the tip and be used with special Livescribe dot paper. You can buy your own or, if you prefer, print it yourself. I’m personally partial to the bound notebooks that look and feel like something you would get from Moleskin. The nice thing is that Livescribe makes an assortment of different paper and notebook formats available so there is something for everyone’s needs. And because the company was going for a more refined look, they put the microUSB charging port beneath the end cap, and they made the end cap function as a tablet stylus. It is a nice little extra. 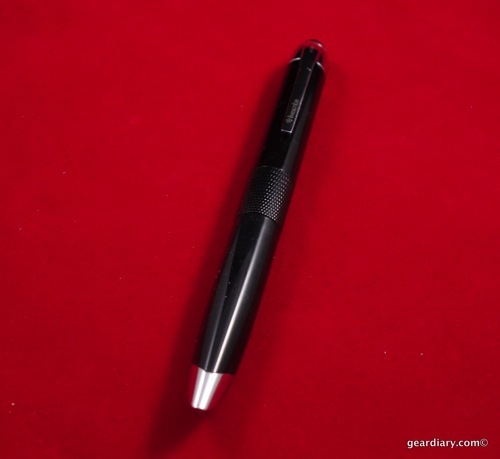 Elevate Your Writing: From the integrated stylus cap to the Swiss-made tungsten-carbide ballpoint ink cartridge, the Livescribe 3 smartpen is a statement of elegant design that delivers the experience of a premium writing instrument. 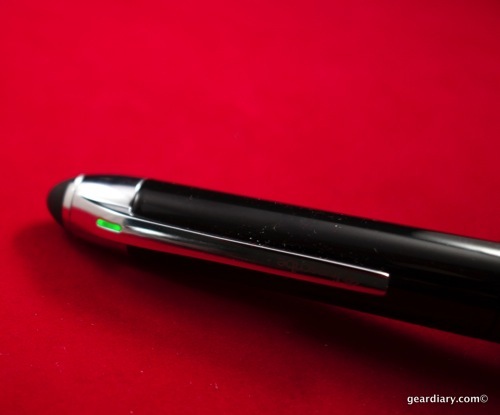 The black ring around the pen serves as the power “button” and the only indicator light on the pen is a small light in the clip. When it glows blue, you know it is connected to a tablet or smartphone via Bluetooth Smart. And when paired with a tablet or smartphone, the app captures handwritten notes, captures the audio heard while creating the notes and keeps the two in sync so you can hear wheat was said while the note was taken. In addition, the “Feed” within the app converts handwritten text into type that can be shared via a number of services. If your iPhone or iPad isn’t handy, or the Livescribe 3 Smartpen is on but not connected to an iOS device, there’s no need to worry. The pen will store the text you write on the Livescribe paper and then, when connected to an iOS device at some later date, transfer those notes over and recreate the pages in virtual form. Unfortunately the same cannot be said for the audio capture; that requires the iOS device to be connected. 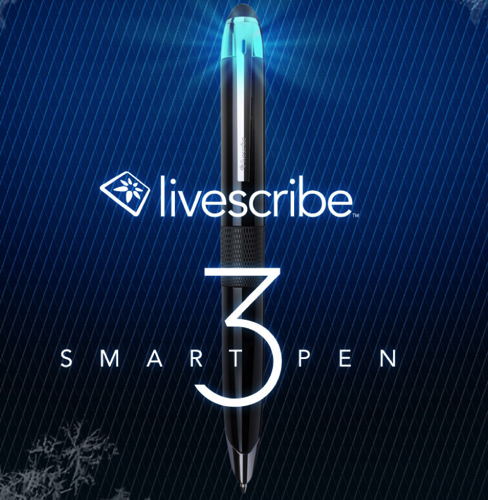 This video offers a good initial look at what the Livescribe 3 Smartpen looks like in action. The Livescribe 3 Smartpen works amazingly well but that is only true if you use an iPhone or iPad since this is currently iOS-specific. Support within Android will arrive, but there are some technological hurdles that have to be overcome first. Since I am pretty much all-in with iOS and have devices on other platforms for review purposes only, this smartpen is perfect for me. And since I never leave home without my iPhone and rarely go out without one of my iPads, having a smartpen that is an extension of my iOS device makes perfect sense. I do love the fact that it looks less like a tech-pen and more like a high-end writing device, and I love the new app. We’ll take a closer look in another post. 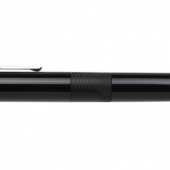 There are two versions of the Livescribe 3 Smartpen currently available. Both offer the same pen technology, but each pen has a slightly different look. In addition the Pro Edition package comes with a leather-bound notebook and a one year upgrade to Evernote Premium. As someone who loves using a Livescribe Smartpen and relies on iOS devices, I love this update to the Livescribe ecosystem. The pen is more like a pen; the tablet integration is tight, and the ability to use, share, and search the notes you take is fantastic. If you are happy with your current Livescribe smartpen, there’s probably no reason to upgrade, but if you want to cut the cord and do more with your smartpen, then you want one of these. Check it out! Ready to buy one? Save 15% by clicking this referral link.